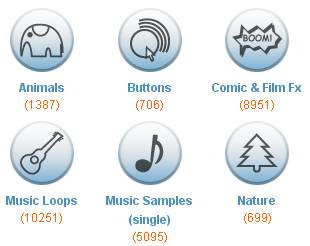 SoundSnap: These sounds are free for any use, commercial or not. Very big library, sorted by categories. They are the source of sounds for many virtual worlds and 3d chat communities. The categories are organized in attractive icons, making navigation very easy. Most of the sounds are in MP3 and WAV formats. Absolute Sound Effects: Big collection of sound, suitable for personal use. Most of them are in WAV format. thank you for this very useful bond which is in my favourites now. I'm glad that this was useful for you. As you know, in this site there's not only news but also any resource that is useful for web3D or virtual worlds.